frequently-recurring pirate villains; and aside from Captain Pugwash and DC/All American's Black Pirate, there's a real dearth of pirate heroes. So when Fox Kids' TV (Bobby's World, Sam & Max) launched Mad Jack the Pirate in 1998, it wasn't so much betting on a sure thing, as bucking the odds. Mad Jack joined Fox's Saturday morning schedule on September 12, 1998, as did his assistant/sidekick, Snuk. Snuk was a funny animal of indeterminate species  some sources say he was a rodent; others, a marsupial. What's certain is that he wasn't noticeably more competent than Jack himself, that is, not very. Nonetheless, he wasn't shy about pointing out Jack's shortcomings in that area, while remaining loyal to him. Jack never doubted his own excellence, but was stupid, cowardly, greedy, and everything else you'd expect in the bad-guy protagonist of a comedy aimed at children. 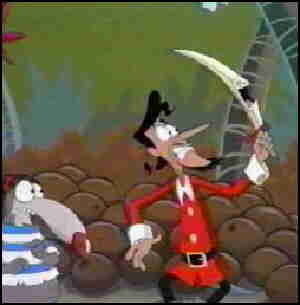 Critics and commentators have mentioned similarities between Mad Jack the Pirate and the British show Blackadder, with Jack himself compared to the title role, and Blackadder's assistant/sidekick, Baldrick, analogous to Snuk. Even recurring adversaries are said to be comparable, such as Jack's Flash Dashing corresponding to Blackadder's Lord Flashheart and Jack's Angus Dagnabbit corresponding to Blackadder's McAngus. The scenario was created by animation writer/director/voice man Bill Kopp (whose writing credits also include House of Mouse and Roger Rabbit). Kopp also provided Jack's voice, as he did for Eek! the Cat and Tom, at least in a few latter-day productions, where Tom had one). Snuk was Billy West (Fry in Futurama, Invader Zim). Other voices include Charles Adler (Buster Bunny), Sherman Howard (Derek Powers in Batman Beyond) and Tom Kenny (Spongebob Squarepants). Kopp's writing and directing partner was Jeff DeGrandis (Dora the Explorer). Kopp and DeGrandis also collaborated on Toonsylvania. In the end, Jack was no more successful than the average cartoon pirate. He lasted only one season of 13 episodes. They haven't been rerun. Text ©2011 Donald D. Markstein. Art © Fox Kids TV.